Seriously, I am trying to restrain myself from eating the rest of the pan of this gluten free/dairy free peach cobbler! I am hanging out with the illustrator tonight for his birthday. I figured it is the least I can do since I think he caught the funk I still have! 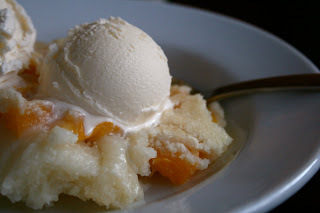 He wanted peach cobbler tonight for his birthday dinner. This is low sugar too! I will share details later because all southern celiacs will rejoice at this!!! I would LOVE the details on the recipe! Sounds so good!!! you're welcome for the support! Oh my gosh...share that recipe!! YUM!